The Solemnity of the Immaculate Conception is probably one of the most, if not THE most, misunderstood feast day in the Catholic Church. If you ask 100 Catholics what the feast day is about, I'd wager at least 25% of them will give you the wrong answer. This day is so important that not only is it a "Solemnity", but even if it falls on a Saturday or Monday Catholics are required to attend Mass. There's no "twofer" when it comes to this Solemnity; the Saturday vigil does not count for both the holy day and the Sunday obligation. It ranks right up there with Christmas in that aspect. This Feast is about Jesus being conceived without sin, right? WRONG. Mary, whose womb housed our Savior, was conceived without sin. For those who have a problem with this concept, think of it this way: Would God allow His only son to be physically developed in a womb that was less than perfect? The answer to that question should give you insight into this most special day on the liturgical calendar. This is when it all began: God had a plan for Mary from the day of her conception (and really, even before). Just as he has a plan for all of us from day one, He also had a plan for Mary...and for mankind. In reading Luke 1:26-38, I think the phrase that usually sticks out for people is "How can this be, since I have no relations with man?" (Luke 1:34) Or it may be "May it be done to me according to your word" (Luke 1:38). As I read it, what struck me was "...for you have found favor with God" (Luke 1:30). Wait a minute...Mary was conceived without sin, so how could she have "found favor" with God? Wouldn't she have had it all along? Then I thought about how we all have free will...Mary included. I would assume that Satan tried his best to get her to sin all through her life, especially when she was little. We all did things when we were little that were sinful, but Mary was kept pure. She could have sinned but chose not to. When I read this passage, I think about how excited she, as a young lady, must have been to be betrothed to such a kind man as Joseph. What a wrench God put in her plans! I imagine that her plans were to marry Joseph, have a house full of kids and then grandkids, and have her boys become carpenters like their dad. Then along comes this angel Gabriel with this mind-blowing question: Will you be the Mother of God and, in doing so, become the mother of all mankind? Did she see all her dreams vanishing? Or did she realize that this is what her purpose for being was? I'm a control freak, although I'm actually getting better with this flaw. I like for things to be planned out so there are no surprises. Except there are always surprises. We all know God has a sense of humor. He's constantly letting me know that He's in control, not me. When my plans get a wrench thrown at them, I need to remember the wrench God threw Mary and be able to calm down and accept it. Now, about that angel...it struck me during Mass that Mary was only told about the good things. What about the part where her heart would be ripped out because there would be people who wanted to kill her baby from day one? What about having to watch her son hang on a cross and holding his dead body in her arms? Of course, we don't know the whole conversation. That's the bottom line: We only know what we're meant to know at this point. God prepared her from the moment of conception to be His bride. He chose Joseph to be the earthly father of His son. Assumedly (this is just my thought), God took Joseph from this life so the bond between Mary and us would be stronger. If Joseph had been living at Jesus' death, he would have been the one to care of Mary. If Jesus had brothers or sisters, they would have been the ones taking care of her. But Jesus, in giving her to John, gave her to all of us. He shared his mother with all of us, to be our mother. What a gift He gave us! In addition to everlasting life, He gave us His mother. I can just imagine the bond He had with her. We don't know when Joseph died, but I have to imagine that the bond between Jesus and Mary only deepened after his death, if that's even possible. "Let it be done unto me." (Luke 1:38) How many times could I have said that in my life thus far yet didn't? What held me back? For me, personally, the answer to that is selfishness and fear. Fear of being uncomfortable, not being accepted or of being alone. 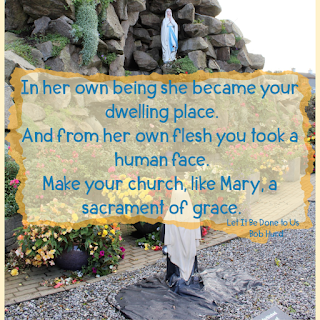 How alone did Mary feel experiencing a pregnancy before being married that no one could possibly comprehend? How alone did she feel knowing that Joseph may not have the faith he needed to believe her? Did Mary run to her mother and tell her what happened? (I know I would have.) Did her parents have any doubt at all about what she said or did they immediately know what she was saying was true? Would I have been able to say "yes" to God? I'm definitely no saint and we know that Mary was groomed from conception to be willing to be the mother of Jesus. If not, she wouldn't have been the Immaculate Conception. I've always had difficulty understanding why Mary is called "the new Eve". But I think I understand it now with Genesis 3:20: The man called his wife Eve, because she became the mother of all the living. My explanation: When Jesus was on the cross He gave his mother to all of us when he told John, "Behold, your mother." (John19:27) Eve was created in a state of grace just as Mary, but she fell from that grace, unlike Mary. When Jesus gave all of us Mary as our mother, Mary became the new Eve. If you weren't clear about the Immaculate Conception, know that you aren't alone. 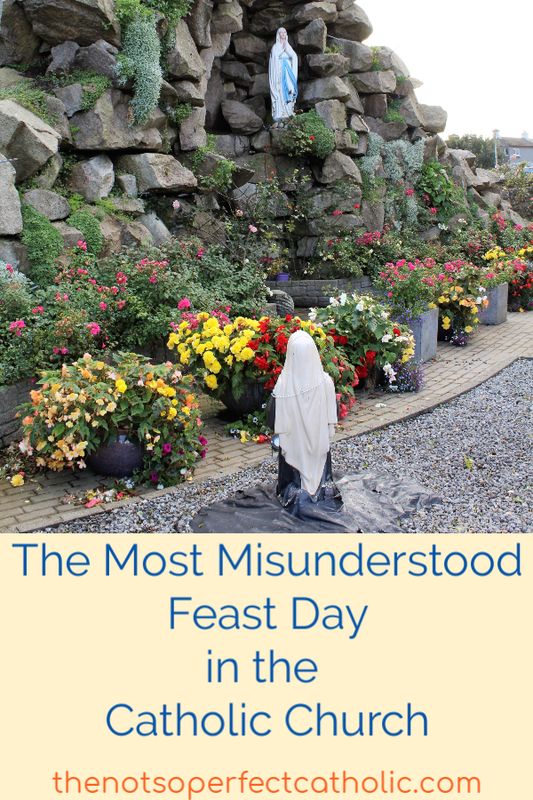 I truly believe this is the most misunderstood feast day in the Catholic Church. If you're a Catholic, I hope I've given something to think about. 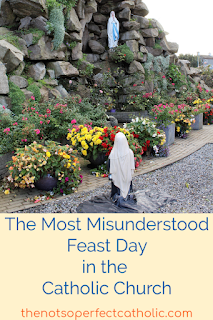 If you're not Catholic, I hope this post has explained this most Holy Day to you and given you some insight on why this day is or should be so important to not just us, but to Christians everywhere. The fourth time Mary appeared to Bernadette in Lourdes, Mary called herself "The Immaculate Conception". That was how the priest knew it was Mary appearing since Bernadette had never heard that title. The formal doctrine of the Immaculate Conception wasn't proclaimed until December 8, 1854, by Pope Pius IX. Our Holy Lady Immaculately Conceived is the Patroness of the United States.